We offer biblical stewardship advice and general Christian financial advice not only in Michel's books and at his seminars, but on a 6-hours 7-Branches of Managing God's Money 6-CD set and a 2-DVD set. In addition to several vignettes, this presentation is an unedited, live seminar, without re-takes. Treat yourself to the seminar atmosphere as you listen, watch, and learn at your convenience. Say goodbye to financial stress; welcome God's peace that passes all understanding as you learn from the veteran business executive and professor of business administration, Michel A Bell, how to become a better manager of God's resources. He builds his teachings on biblical stewardship principles, which have been proven to be effective business practices. Listen to the vignettes filmed outside the seminar with a married couple as Michel answers their questions and discusses planning, budgeting, and more every-day issues. The Bible contains everything you need to be an effective steward. The seven branches of God's money captures the essence of biblical stewardship and solid Christian financial management principles. 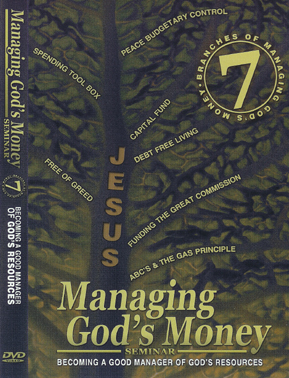 To enhance the seminar experience, Managing God's Money published Managing God's Money: 7 Branches Workbook to use at and following these seminars. It's a Bible study that expands the earlier workbook. Use it alone, or with the CD or the DVD. You will get maximum benefit if you listen to the CD or DVD as you go through the workbook. Still, it works well alone. This 6-CD set is available from Managing God's Money only, and at Managing God's Money and Managing God's Time seminars at US$30 including shipping and taxes. This 6-CD set is the 6-hour seminar DVD without video. The six-CD set with Managing God's Money: 7 Branches Workbook, are excellent resources for premarital counselling and excellent wedding gifts. Click here to pay by PayPal. Please include shipping details in the special instructions to the seller section of the PayPal payment form.